Three Fabulous New Dates Confirmed for July! The astonishing true story of Wiltshire’s forgotten First World War heroine, brought to life with storytelling and song by two talented performers. The Heroine Project Presents are delighted to confirm that we will now be sharing Dorothy’s amazing story with four brilliant – and very different – audiences this June and July. In addition to our very special performance on Thursday 30th June at the Chalke Valley History Festival against the backdrop of the beautiful Wiltshire countryside, on Thursday 7th July we will be heading to Bristol to the heart of Stokes Croft for a performance at Hamilton House. On Friday 8th July we return to Wiltshire for a performance at the Bradford on Avon library, and on Monday 11th July we will be doing a bespoke performance exclusively for staff and students and Hayesfield Girls’ School in Bath. The performances at Hamilton House and at the Bradford on Avon Library will be accompanied by a touring exhibition from ‘Wiltshire at War’ that reveals some of the previously untold secrets of Dorothy’s life, and her connections with Wiltshire. After these performances, the audience will be invited to participate in a fascinating half-hour discussion, in which creative team share some of the intriguing original research that has informed the production. June 1915, Dorothy Lawrence set sail for northern France, intent on becoming the first female war correspondent. Disguised as ‘Private Denis Smith’ she made her way to the frontline of fighting – and came face-to-face with the dark heart of war-torn Europe. Previously undiscovered evidence has revealed that Dorothy spent a significant part of her childhood and adolescence in the Wiltshire town of Salisbury. 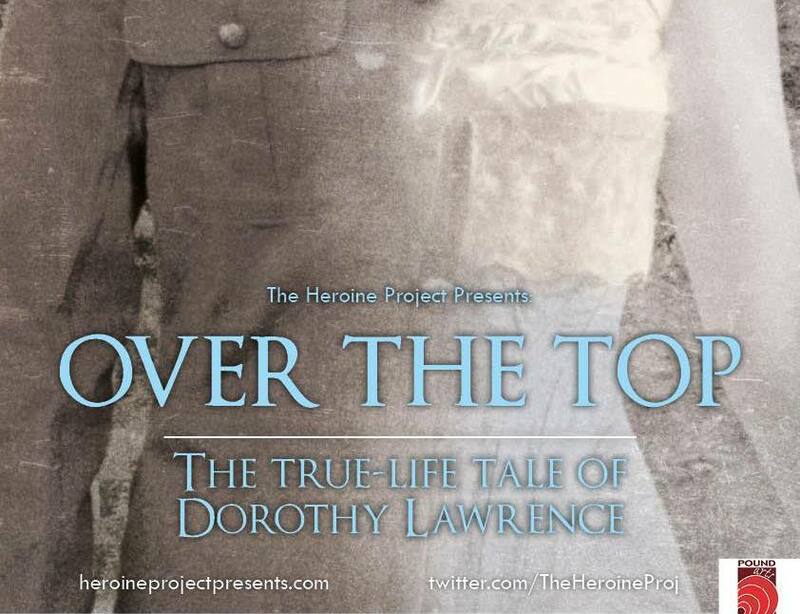 100 years on, Bath-based theatre company The Heroine Project Presents are ensuring that Dorothy gains her well-earned place in the World War One centenary commemorations in the southwest. ‘The Heroine Project Presents’ tells the stories of women from history who have been overlooked or misrepresented. ‘Over the Top’ has been developed with the help of The Pound arts centre in Corsham, and The Natural Theatre Company in Bath. The production is supported with public funding from the National Lottery through Arts Council England, and is generously supported by sponsorship from Gore Browne Investment Management. The exhibition has been developed in partnership with Now Heritage and Wiltshire at War, and has been funded by the Chalke Valley History Trust.